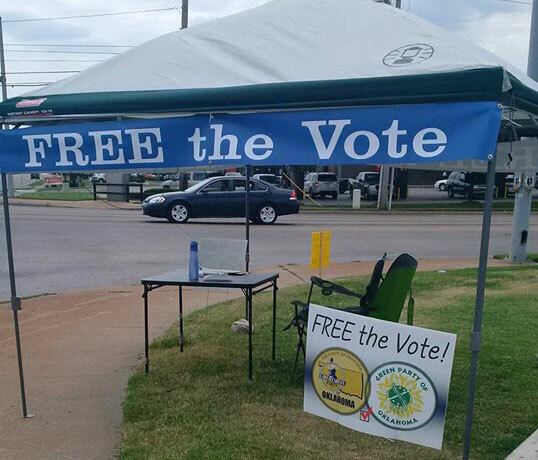 OKLAHOMA CITY – With hands tied in protest, the GPOK will submit its petition signatures for party recognition to the Oklahoma Election Board at 9 a.m. tomorrow. Though short of the required 25,000 signatures, the party wants its petitions on record to exemplify the continued exclusion of alternative political parties from the democratic process in Oklahoma. The official signature count will be available after the March 1 primaries. The GPOK is following several reform measures making headway this legislative session. Senate Bill 896, authored by Sen. Kyle Loveless (R-Oklahoma City), passed unanimously in the Senate Rules Committee and is now headed to the floor for a vote. SB 896 would lower the percentage of votes needed by candidates for governor or president to remain a recognized political party. As it stands, the bill would change the requirement from 10 percent to percent. “We applaud these current efforts by our legislators to give Oklahoma voters more options on Election Day,” Jackson said. Other groups, like the Oklahoma Libertarian Party and Oklahomans for Ballot Access Reform coalition, are also lending their support for such reforms. Future activities include the organization of training events for citizen lobbyists to support this year’s reform measures. The GPOK also plans to launch another petition drive immediately following the November election. Party leaders cite Sanders’ values and refusal to take corporate donations as well as repressive ballot access laws that will not allow their party nominee to receive a line on the state ballot as reasons for endorsement. Norman, OK—This afternoon, the Green Party of Oklahoma’s Cooperative Council unanimously voted to encourage Independents to vote for Bernie Sanders for President of the United States in the upcoming Oklahoma Democratic Primary based upon social media survey results. During the meeting, council members compared Sanders’ positions on issues involving the economy, social justice, feminism, education, and the environment to their party platform. They also agreed to survey GPOK members and other left-leaning voters for their opinion via social media before making the endorsement official. Because registered Independents can now vote in the Oklahoma Democratic Primary, the GPOK believes supporting Sanders is the best way to participate electorally while representing Green Party values. Party leaders sent out a social media survey asking if the party should endorse Sanders. The results showed overwhelming support for the endorsement. The GPOK acknowledges some Greens believe parts of Sanders’ platform, such as his stance on military drones and Israel, do not reflect Green values. Given the lack of options for Oklahoma Greens on the Oklahoma ballot, however, Greens believe Sanders to be the best possible option for those Greens casting votes in Oklahoma’s Democratic Primary. Oklahoma’s ballot access laws, amended by the legislature in 2014, still require approximately 25,000 valid petition signatures for a third party to place a candidate on the presidential ballot. These signatures do not insure the party will retain ballot access after the election. Oklahoma Greens believe the number of petition signatures required for ballot access should be lowered to 5,000. The Green Party is perhaps best known for one of their previous presidential candidates: Ralph Nader. Some Democratic Party leaders continue to cite Nader as the reason Al Gore lost to George W. Bush in Florida during the 2000 presidential elections. When asked about the shadow of Nader’s influence over that election, Green Party of the United States National Delegate Eric Smith embraced Nader’s 2000 presidential run. The Green Party of Oklahoma was formed in 2002 and received its accreditation from the Green Party of the US in May 2005. For more information about Green Party of Oklahoma, visit http://www.okgreens.org. The March 1 deadline to file petition signatures to get the Green Party on the 2016 ballot is right around the corner! Please note that every line of your form does not need a signature for the petition to count. We can accept forms containing a single signature. If you haven’t petitioned, you can still grab a few before March 1. Just ask your family and friends! Want to see your favorite candidates on the ballot in Oklahoma? This year the Green Party and the Libertarian Parties are working together to get both on the Oklahoma ballot. We will both be gathering petition signatures and the total good signatures needed is 24,745 before March 1, 2016. We need to get more than the required number since some are always disqualified. That is not a lot of time but this year the number needed is far less than the 41,242 required in the past and both parties are working together so we have high hopes. A change in state law could give voters more choices among political parties. The law which takes effect November 1st reduces the number of signatures needed for a political party to be recognized in Oklahoma. The Green Party and Libertarian Party have joined forces to launch a signature drive to collect enough signatures to get on the ballot on 2016. By Mark  Posted in Free the Vote!